CENTER VALLEY, PA., October 29, 2013 – Olympus has redefined the enthusiast compact camera by uniting many of the best features found across its camera lineup in the new STYLUS. Designed for semi-pro shooters who demand optical brilliance, DSLR operation, convenience and portability, this one-size-fits-all package has head-turning, OM-inspired looks as well as premium imaging performance. The STYLUS 1 includes an i.ZUIKO lens that incorporates the outstanding optical quality of the Olympus ZUIKO interchangeable lenses. At its heart is a large 1/1.7-inch BSI CMOS sensor and TruePic VI image processor along with additional features, including the built-in electronic viewfinder (EVF) from the award-winning Olympus OM-D E-M5® and Wi-Fi for shooting and sharing anywhere. Whether you want the latest and greatest high-tech tool, or if you simply prefer something that is lightweight and easy to take when you are on the go, there is truly something for everyone. The newly developed, ultra-slim 10.7x (28–300mm*) high-power i.ZUIKO lens features constant f2.8 brightness across the zoom range and is versatile enough to capture wide to telephoto shots and produce pro-quality stills with beautiful, defocused backgrounds and crisp images even when telephoto shooting in low light. The large diameter lens incorporates a powerful, built-in VCM image stabilization mechanism that virtually eliminates camera shake and blur. Its lens can also capture stunning macro shots from 2 inches away. When the lens is not in use, it retracts fully into the camera body (behind a removable automatic lens cap), so the STYLUS 1 fits easily into a coat pocket. 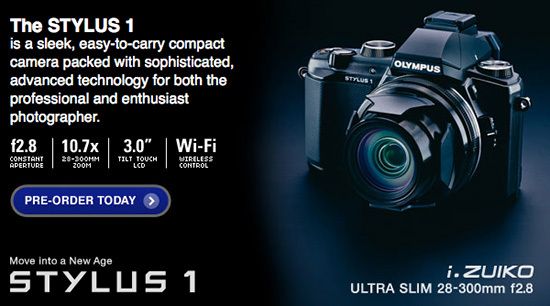 Olympus designed the new lens to work seamlessly with its 12.0 megapixel 1/1.7-inch high-sensitivity backlit CMOS sensor and TruePicVI image processor, the same processor used in the Olympus OM-D E-M5, for fast recovery time and shutter speed to capture images with rich details and low noise. Images come through with true-to-life flesh tones, brilliant blue skies and precise tonal expression. The STYLUS 1 also inherits FAST TOUCH AF system from the Olympus PEN® series for near-instant, precision focusing via the tilt-able LCD touchscreen monitor. The STYLUS 1 is the first Olympus enthusiast, premium compact camera equipped with a built-in electronic viewfinder (EVF). The 1.44 million dot resolution LCD EVF has a 1.15x viewfinder magnification rate (equivalent to 0.58x of 35mm film camera) and 100 percent field of view — just like a DSLR — so users can easily compose their subjects directly with clear visibility from the center to the edges. The eye sensor automatically switches the live view display from the high-resolution 3.0-inch, 1.04 million dot resolution tilt-able LCD touchscreen monitor to the EVF in no time as the camera approaches the user’s eye. A variety of information is displayed in an easy-to-view layout on the EVF screen, including variables such as exposure and color. Built-in Wi-Fi is easy to set up. By quickly scanning the QR code displayed on the camera's LCD with a smart device, it syncs with the Wi-Fi network created by the camera. The free Olympus Image Share 2.1 Smartphone app synchronizes a user’s Smartphone and the STYLUS 1 so the camera’s “Live View” is effectively displayed on the phone, and the camera can be controlled by touching the Smartphone display*. Users can wirelessly adjust various settings, such as the shutter speed, aperture value, ISO and exposure compensation, as well as operate the Live Bulb shooting mode from their Wi-Fi devices. They can also use their Smartphone to embed GPS information into their images. In addition to superior still image quality, the 1080p Full HD Movie capability with stereo sound and high-speed movie recording (120fps/240fps) captures movies for dramatic slow-motion playback of fast-action scenes. The STYLUS 1’s 11 included Art Filters™ with bracketing option, five Art Effects and Photo Story™, which shoots a group of still photos straight into attractive, prepared layouts, effortlessly bring the user’s artistic visions to life. Users can also capture RAW image data for post-processing flexibility, create motion blur effects without overexposing thanks to a built-in ND filter (with 3 EV stops) and capture up to 7 frames per second in full resolution! This entry was posted in Olympus and tagged Olympus STYLUS1. Bookmark the permalink. Trackbacks are closed, but you can post a comment.